Molybdenite, MoS2 (molybdenum = pink; sulfur = yellow). 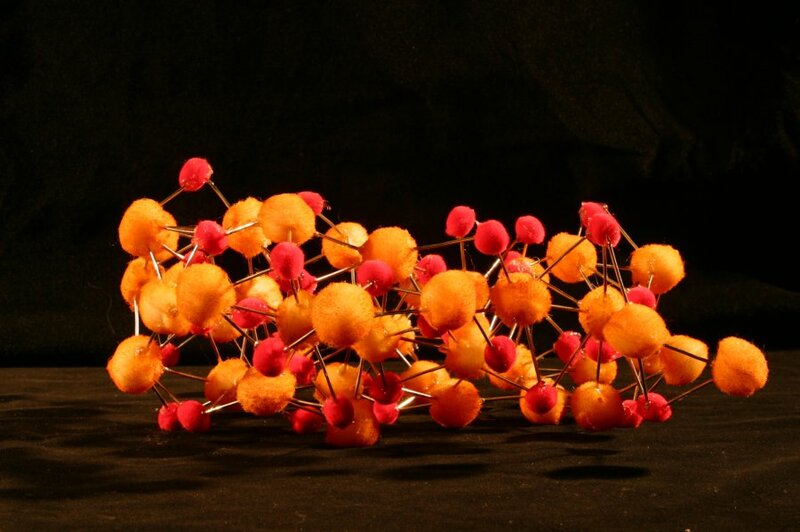 A hexagonal crystal system constructed of molybdenum ions bonded to two layers of sulfur atoms through ionic bonding. 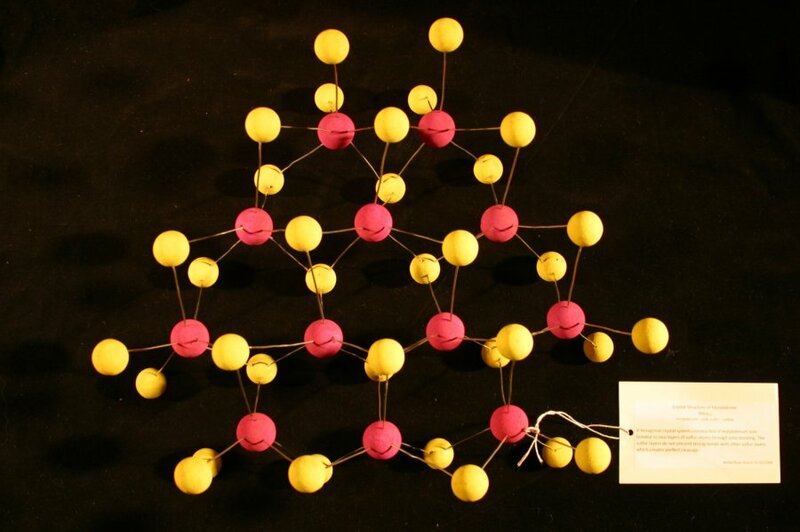 The sulfur layers do not present strong bonds with other sulfur layers, which creates perfect cleavage. After moving to Pasadena to begin his graduate studies in 1922, it was decided that Linus Pauling would begin working as Roscoe Dickinson’s sole graduate student. Dickinson received the first doctorate from the California Institute of Technology in 1920, having joined the staff there after completing his undergraduate studies at M.I.T. in 1917. In late September of 1922, Pauling and Dickinson were working on structure determinations of crystals with the use of X-ray diffraction, and Pauling was initially encouraged to determine the structure of the lithium hydride crystal. However, after three weeks of synthesizing the crystals and setting up his photographic apparatus, he was forced to abandon his work upon receiving word that the structure had recently been determined in Holland. 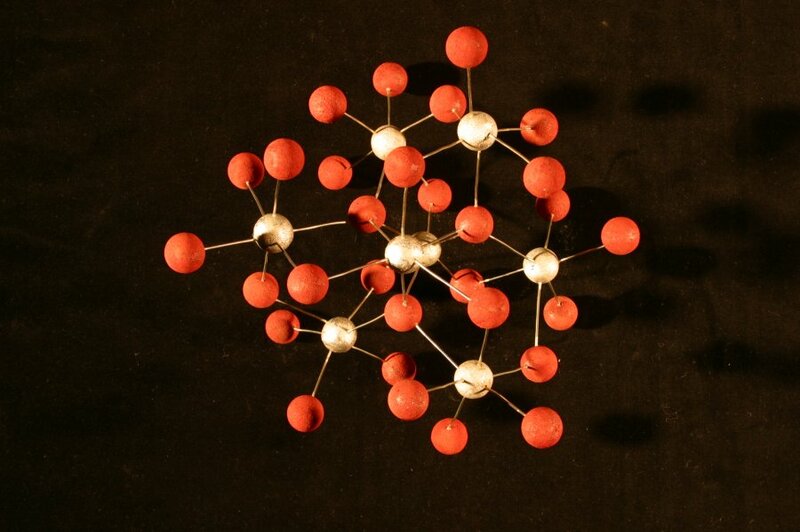 Pauling then created crystals of fifteen different organic substances. He subjected some of them to preliminary stages of X-ray analysis, but none of the samples proved sufficient for the work. 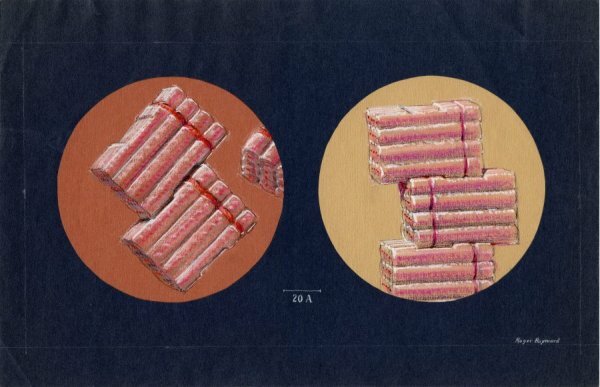 After these disappointments, Dickinson helped Pauling work through the process of determining the complete structure of the molybdenite crystal. Molybdenite, or molybdenum sulfide, is a very soft metallic mineral. Its properties include a bluish-silver color and a greasy feel that can leave marks on fingers. It has a very high melting point, so it is often alloyed with steel to make it stronger and more heat resistant. It is also an important material for the chemical and lubricant industries, and can be used as a catalyst in some chemical applications. Molybdenite crystals bend easily but are not elastic, making X-ray spectral photo analysis, the method used by Pauling and Dickinson, somewhat difficult. 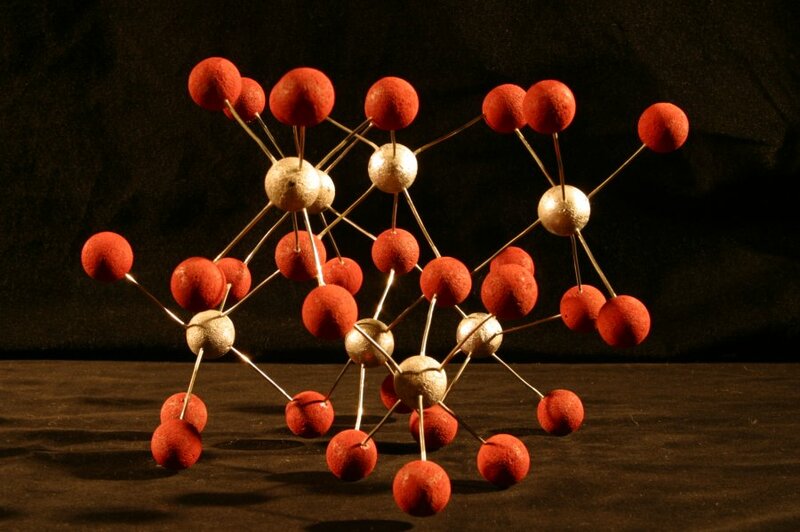 Despite these issues, Pauling and Dickinson managed to take a suitable photograph and were able to determine the crystal’s structure. Molybdenite was expected to have an octahedral atomic structure. 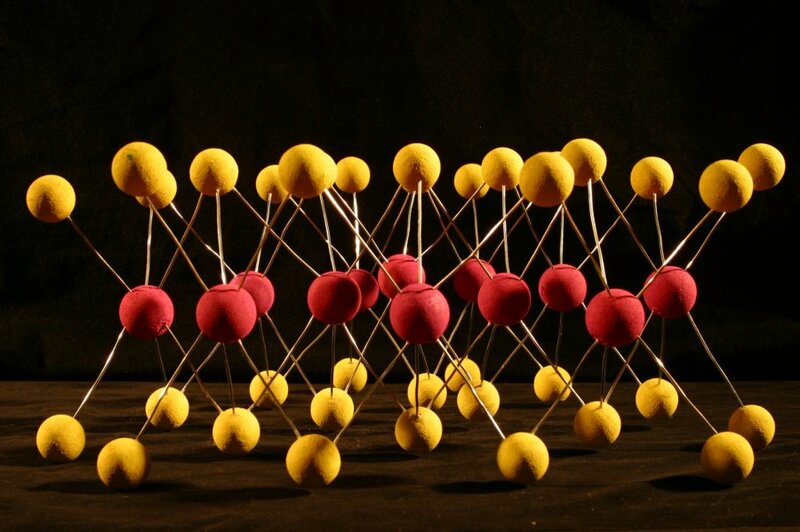 Pauling and Dickinson discovered that it was instead comprised of six atoms surrounding the corners of a trigonal prism. This surprise demonstrated, among other things, the potential for unpredictability and excitement in chemical experimentation. Fresh off their laboratory success, Pauling co-authored his first scientific paper with Dickinson. It appeared in a 1923 issue of the Journal of the American Chemical Society under the title “The Crystal Structure of Molybdenite.” The success renewed Pauling’s confidence in his capacity to carry out professional scientific analysis, and instilled in him an understanding of the value of well-planned experimentation. The process likewise provided him with a valuable framework that he began shaping and developing to fit his particular temperament. Throughout the rest of the 1920s and 1930s, he would use this method to write and publish multiple crystal structure papers nearly every year. 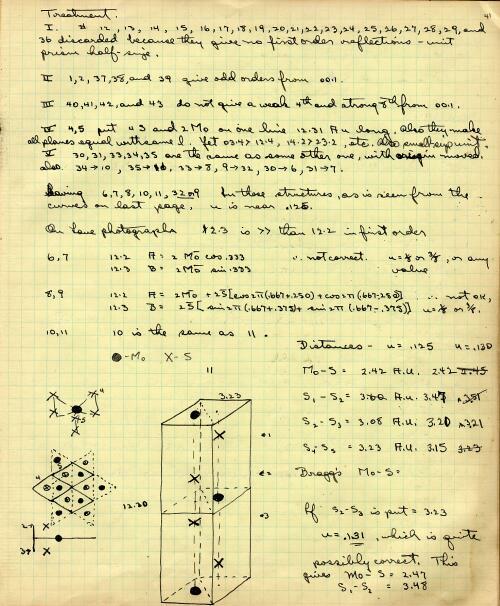 Pauling notebook entry documenting work on molybdenite, 1922. 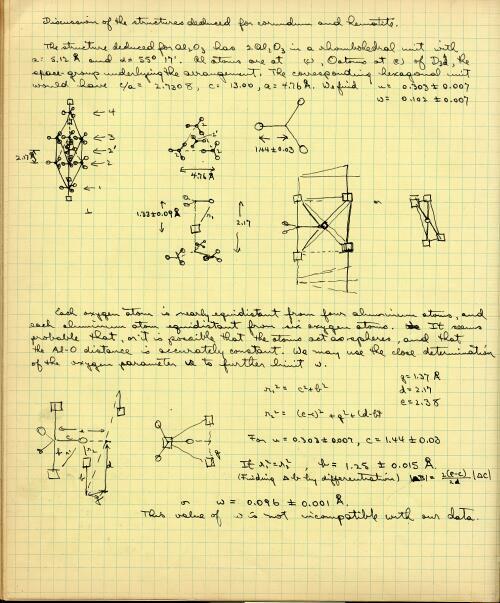 Much of Pauling’s early work on the structure of molybdenite is detailed in his Research Notebook 2. 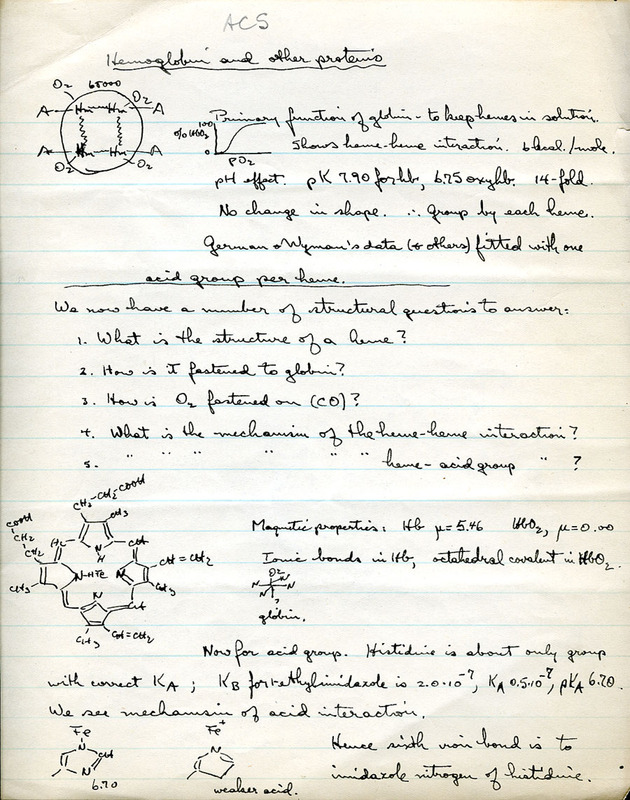 For more on his amazing achievements in structural chemistry, see the website Linus Pauling and the Nature of the Chemical Bond: A Documentary History. Today, December 1, 2008, is World AIDS Day. In honor of the fight against AIDS, The Pauling Blog would like to discuss Pauling’s own attempts to find a cure. Beginning in the early 1930s, stemming from early investigations into the chemical nature of hemoglobin, Linus Pauling became deeply interested in the application of chemistry to medical problems. Once involved in a long-term study of the substance, he began to recognize the significance of hemoglobin to the health of individuals. In 1949, Pauling coined the term “molecular disease” in reference to a mutation in hemoglobin cells that caused sickle cell anemia. His interest in medicine did not stop there, however. During World War II, Pauling designed a meter to measure oxygen levels aboard U.S. submarines. He later converted this meter to be used in incubators for premature babies with underdeveloped lungs, saving thousands of lives in the process. In the early 1970s, Pauling developed an interest in the use of megadoses of vitamins as a means for both preventing and treating disease. He became particularly interested in vitamin C because, even in huge doses, it proved to be non-toxic. Pauling began recommending its use to prevent colds and other illnesses, eventually suggesting that a high-dosage vitamin C regimen could help cancer patients by fortifying the immune system and potentially destroying carcinogens. With the onset of the AIDS crisis in the early 1980s, Pauling saw potential for another area in which vitamin C could be put to good use. Though he did not officially endorse vitamin C as a treatment for AIDS until the early 1990s, he commonly noted its possible benefits and lack of side effects. In 1988, Pauling headed a study on the effects of vitamin C in combating the AIDS virus, measuring the impact that ascorbic acid had on infected T-cells. The results, though not extraordinary, were promising. In 1990, Pauling and his colleagues published the results of their study in the Proceedings of the National Academy of Sciences, claiming that vitamin C appeared to suppress the growth of the AIDS virus. As was true of Pauling’s previous claims regarding vitamin C and orthomolecular medicine, the studies were at least a source of intrigue to many, though likewise dismissed by a wide cross-section of the medical community. 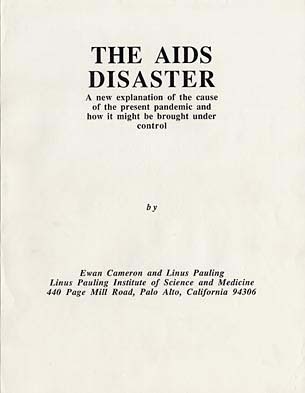 At the same time that Pauling was embarking on his AIDS research, Ewan Cameron, a researcher at the Linus Pauling Institute of Science and Medicine in Palo Alto, approached Pauling regarding a book he was writing entitled The AIDS Disaster. The book was meant to serve as a comprehensive study of the AIDS virus, describing its history, socio-political context, and related research. Cameron requested that Pauling serve as co-author, editing the book and providing a chapter on vitamin C and AIDS. 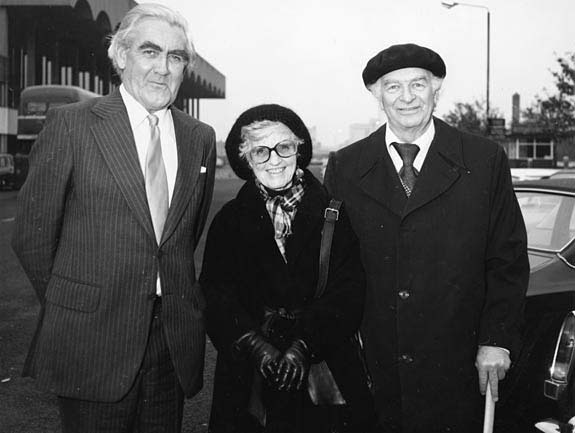 Pauling agreed and, in late 1988, the book was completed. Due to a variety of publishing issues, the text never reached bookstore shelves, but several complete versions of the manuscript are held in Cameron’s papers here at Oregon State University. Until his death in 1994, Pauling continued to emphasize the responsibility of the scientific community to help cure diseases such as AIDS and cancer. 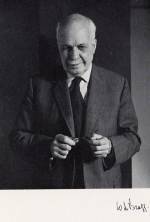 He gave frequent lectures on the subject of orthomolecular medicine and continually worked to increase support for medical research. For additional reading on Ewan Cameron’s AIDS work and research, check out the Cameron Papers finding aid, hosted online by the OSU Libraries Special Collections. Please also note that a few more of Pauling’s thoughts on the treatment of AIDS with ascorbic acid are linked off of this index page from the Linus Pauling Research Notebooks website.